Great article on Together for Adoption at the North Carolina Baptist website. We are planning our second conference for fall 2009 in Nashville, TN – stay tuned! The first Together for Adoption conference was held this past Saturday, November 1st. Over 160 people gathered together to consider our adoption in Christ and its profound implications for orphan care and the earthly practice of adoption. 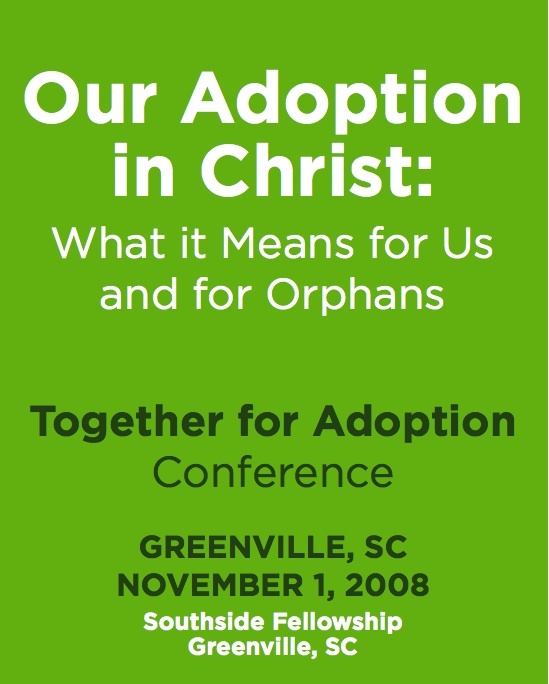 Rick Phillips, Carl Robbins, and Tullian Tchividjian not only gave us great cause to rejoice afresh in God’s provision of adoption through Jesus Christ, but also much food for thought about how our adoption by God should inform and shape the church’s ministry to orphans. God gave us a wonderful day. It was also our privilege to serve with so many committed volunteers. They served with much humility and grace. We thank God for each of them. We could not have held the conference without them. For those of you who were not able to attend the conference this past Saturday, we hope to have the audio available for free download before the end of this week.